CHATTANOOGA, TN. 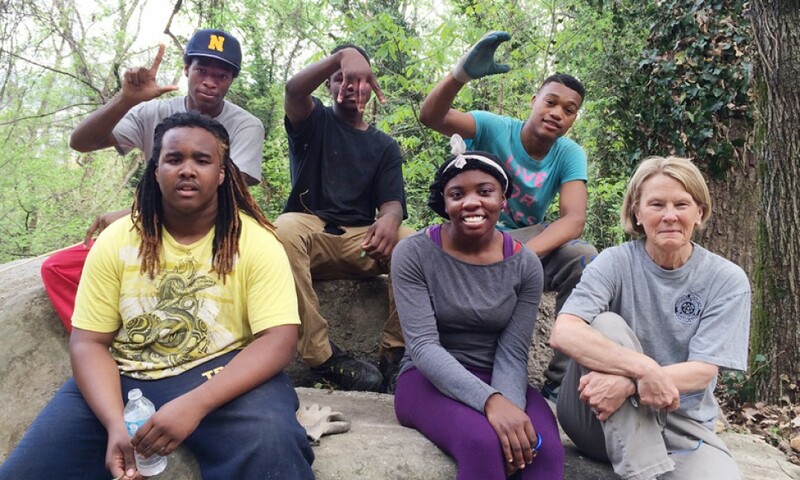 — The sounds of pic axes and shovels scraping over rocks is something that the youth at The Howard School’s Interns and Leadership Program have become accustomed to. So, too, have the discussions over lunch breaks related to how to better channel run-off from a possible storm, or build a more effective trail given extreme weather connections. Students evaluate the slope of where they are working on Lookout Mountain, consider the proposed path of the trail, and develop a plan and strategy on how they are going to continue what has become a multi-faceted program to both restore the Mountain’s habitat and build a trail that runs from Ochs Highway to the top of Scenic Highway for public enjoyment. But it’s more than hard work in all sorts of weather. These students are part of a highly successful partnership between Lookout Mountain Conservancy and The Howard School where they participate in training to develop leadership skills, academic achievement, problem-solving experience and self-esteem. As a result of this program, students have achieved a 100% high school graduation rate (exceeding the school’s general graduation rate). “We work super hard; there is no doubt about it,” explained Andre Calloway. Given the program’s success, the students have now been asked, along with Robyn Carlton, CEO of Lookout Mountain Conservancy and the program’s visionary, and Zak Brown, principal of The Howard School, to present the keynote address at the Land Trust Alliance’s Southeast Regional Conference for Land and Community Conservation on May 12th. They will be speaking along with the Land Trust Alliance’s new president, Andrew Bowman, who will be focusing on the benefits of community conservation throughout the southeast. The two-and-a-half-day conference will be held in Birmingham, Alabama and attracts upwards of 200 people involved in conservation, community-engagement, and environmental education. Conceived by Ms. Carlton in collaboration with teachers and other leadership partners at the Howard School, the program has steadily grown over the past five years. All told, the program works with 150 ninth graders throughout the school year as well as 18-25 students on a more intensive basis as part of the Intern and Leadership Program. After going through a rigorous application process designed to focus on those students who need the mentoring the most, yet have a desire to invest in themselves and their academics, those who enroll in the Intern and Leadership program spend up to four years (as part of their education) working on weekends, school breaks, and over the summer learning and developing skills that will last a lifetime. For many of these students it’s the first time spending time out-of-doors on the Mountain, the first time talking about which college or technical school might be right for them, and the first time attending community events as public speakers and local youth leaders. Last year, Ms. Carlton, her colleague Creech Hardee, Principal Brown and Jen Politano, Rotaract, and four students were asked to travel to Charleston, South Carolina to discuss the program with interested civic leaders, high school and middle school principals as well as land conservation groups such as the Lowcountry Land Trust.